Acclaimed local artist Wendy Hodder has illustrated many children's books and is a renowned mural painter and sculptor. Over the years, since graduating from Design School at Wellington Polytechnic, Wendy has illustrated many children's books, the best known being the award-winning Grandpa's Slippers series. More recently she has become a painter of murals, enjoying the opportunity to paint on a large scale and be in contact with passers by - after many years of sitting alone at a desk drawing small things it is very refreshing to be out in the world working big on a wall with a speedbrush and roller. 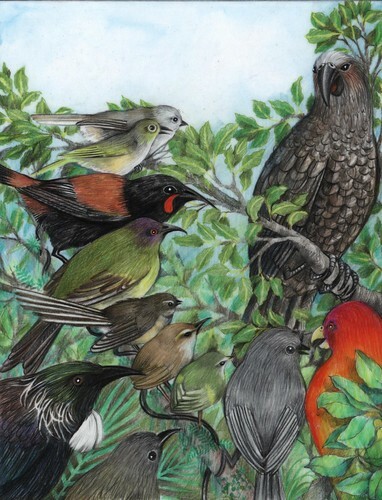 An illustrator at heart, she likes to have a story to tell, her favourite stories being creation stories of the Maori, and images of earth and sky, forest and birds, river and sea. She spent some time as a student at Tukorehe marae finding beauty within the Maori language and values - especially a great respect for spirit and nature. She loves painting spirals and koru - which she feels reflect the flow of the energies of life- everything in nature moves in spirals. Wendy likes using acrylic paints as she doesn't fancy bathing in turps and she like to make her own canvases to whatever size takes her fancy. She also loves to play with clay and stone, carving oamaru stone and painting stones of all sizes. Wendy lives near Foxton with her teenage children, assorted animals and wild garden.